A bit of a clickbait title if I am honest, but Mississippi does have one of Alabama’s HABS structures. The “Jacinto” Doctor’s Office was originally located in Bexar, a tiny community in Marion County, Alabama located 2 ½ miles from the Alabama-Mississippi state line and 42 ½ miles, as the crow flies, from its present location in Jacinto. Bexar was never in danger of being considered a metropolis but was at its height a small farming community stable enough to have a post office that operated nearly continuously (with the exception of two short periods totaling six years) from August 12th 1843 to February 15, 1974. Bexar stands out in hilly Marion County for being located in a large area of flat, fertile farmland along Hurricane Creek. 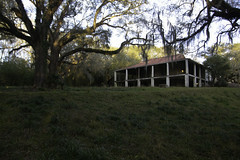 Its site along Hurricane Creek also allowed for potteries to operate in that area. The “Jacinto” Doctor’s Office was the office of Dr. Achilles Lucian Moorman, who lived and practiced in Bexar for several decades. Dr. Moorman was born in 1843 and was a graduate of the Kentucky School of Medicine. He was not a native of Bexar or of Marion County but once he settled there he became a prominent figure in the county, serving as the President of the Marion County Medical Society and was described as “one of the most noted physicians in West Alabama” as well as a “staunch Democrat and a wise party leader.” Like many people in that area, he had connections to people and places in both Alabama and Mississippi; his wife Mary Ophelia Stone’s family were founders and prominent citizens in Tremont, Mississippi (which was originally named Stones Crossroads after them). Dr. Moorman’s daughter Jessica attended the Oakland Normal Institute, a designated Mississippi Landmark, in the rural Itawamba County community of Yale as well as the East Mississippi Female College in Meridian. Dr. Moorman died in 1922 and is buried with his wife’s family at Stone Cemetery in Tremont. 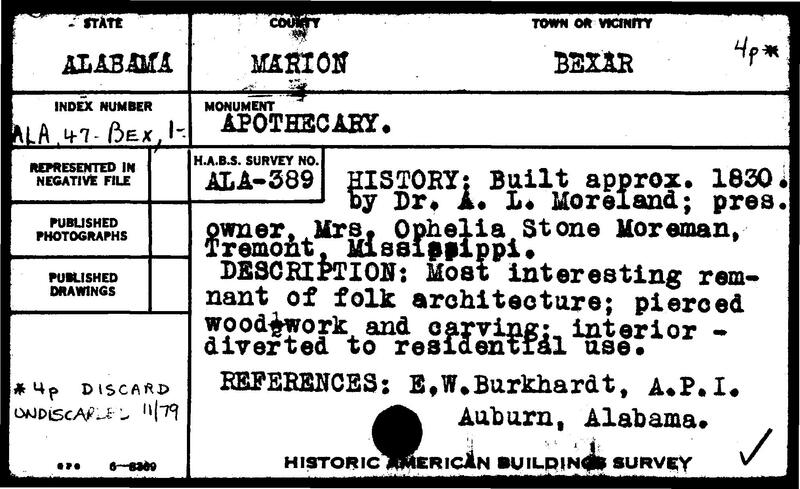 Moorman, Dr. A. L., Office (Old Apothecary) (AL-389), approx. 500’ E of Co. 13 facing S on unmarked dirt road 0.6 mi. S of Co. 13 intersection with U.S. 78 and 0.1 mi. N of old U.S. 78; about 10 mi. W of Hamilton. 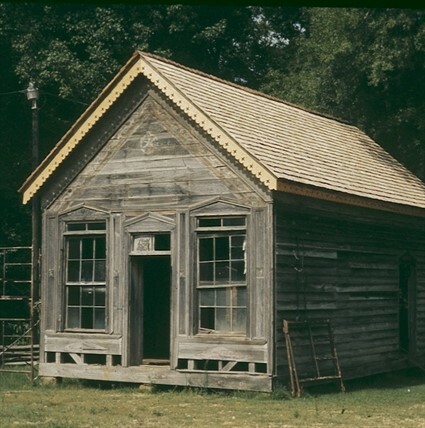 Frame with clapboarding (façade flush boarding), rectangular (3-bay front), 1 story, gable roof with wooden shingles, façade at gable end embellished by applied wooden ornamentation, scroll-cut fascia; 2 rooms (front to back). Built between 1873 and 1875 for Achilles Lucien Moorman (1843-1922), ex-Confederate officer, physician, and graduate of the Kentucky School of Medicine; front room used as office, back room initially as lodging for Dr. Moorman. Structure moved to Booneville, Miss., ca. 1975 and restored. Stylistically similar to the nearby M. D. L. Spearman House (later Dr. Moorman residence), built ca. 1870 and ruinous in 1980. 2 ext. 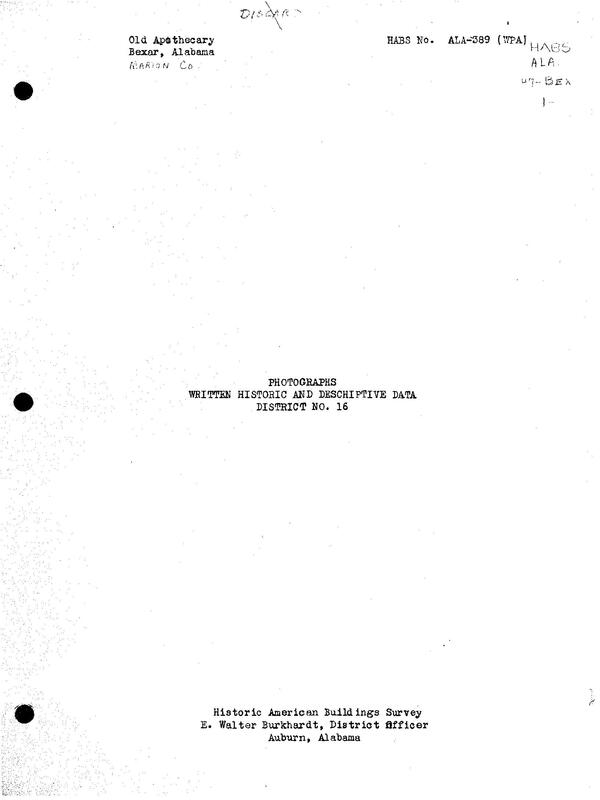 photos (1936), 2 int. photos (1936). 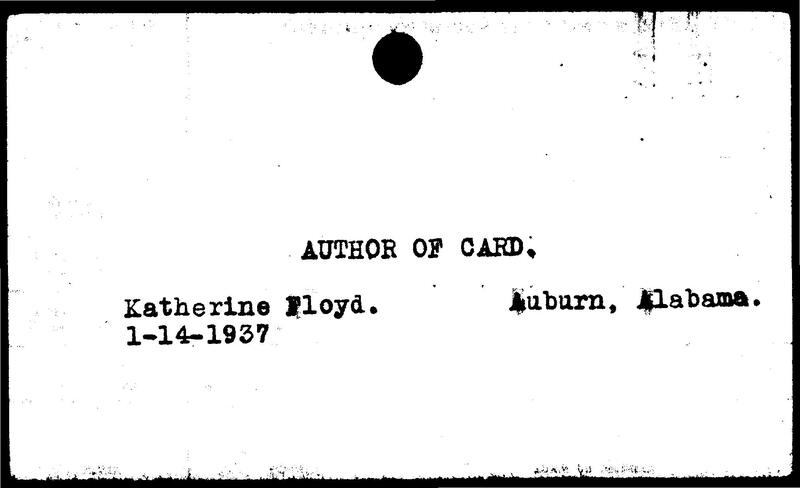 The inactive but still informative blog Itawamba Connections by Mona Robinson Mills, a local historian who is also the author of the books Itawamba County and Fulton in Arcadia Publishing’s Images of America series, is the only source besides The Alabama Catalog for information about Dr. Moorman’s Office. 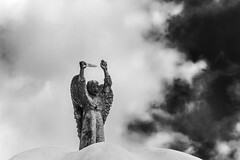 Two posts on the site, “Morman Bonaparte Stone and Leona Kathryn “Kate” Robinson Stone” and “Dr. 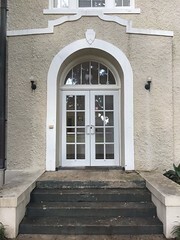 A. L. Moorman’s office in Bexar” contain information that would lead one to believe that Dr. Moorman’s house and office were designed and constructed by the same craftsman. 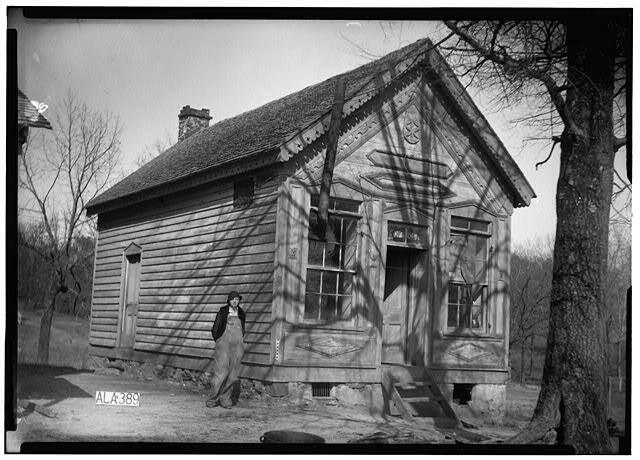 Both had a signature rope molding around interior and exterior doors and windows, which can be seen both in HABS photos and on the exterior of the office in Jacinto today (possibly in the interior, though I have never seen the office open to the public during my visits). After his death, Dr. Moorman’s house in Bexar was purchased by Morman Bonaparte Stone and his wife Kate. Ruinous in 1980, I saw no trace of it several years ago when I passed through Bexar. His office remained the property of his widow by the time HABS documented it. 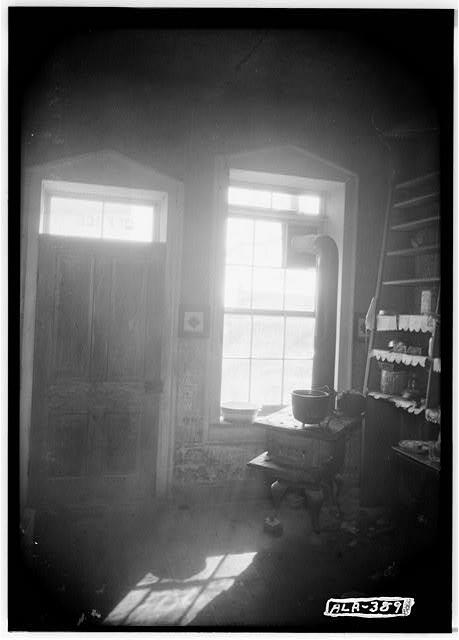 On March 3, 1936, HABS photographer Alex Bush took two exterior and two interior photographs of Dr. Moorman’s Office, named in the HABS files as the Old Apothecary. It was the only Marion County building surveyed by HABS, part of a short tour of Alabama’s northwestern hill region that saw the James Greer Bankhead House and George Bankhead House in neighboring Lamar County surveyed the next day. Alabama’s HABS office was run with evangelical passion by E. Walter Burkhardt, the Alabama District Officer and Auburn University School of Architecture professor in partnership with his wife Varian, who proved exceptional at public relations, writing a regular newspaper column on HABS activities and drumming up community support for HABS throughout the state. Their efforts are the main reason why Alabama’s HABS collection is so extensive and varied. Alabama’s HABS office surveyed over 500 buildings at a rate of one every three days, covering every section of the state, and representing 46 of the state’s 67 counties (compared with 22 of 82 Mississippi counties). Under the Burkhardt’s purview, Alabama’s HABS office surveyed far more than the typical historic mansions. The Dr. A. L. Moorman Office’s presence in the HABS collection is a sign of that, as it is an example of a small, gable-front building typology that was once common in the South as a staple of the antebellum townscape. But, buildings like the Dr. A. L. Moorman Office are now quite rare. As towns grew, these buildings faced increased development pressure. Most were replaced by the larger, two-story brick commercial buildings now so familiar to us in our historic downtowns, buildings that occupy the entire lot and street frontage, creating a streetwall different to the antebellum and early postbellum landscape of most Southern small towns. Being small and wood-frame, attrition due to fire and neglect has also contributed to their current rarity. 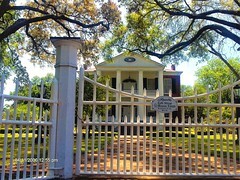 The few surviving examples are found mostly in small, antebellum towns that did not grow after the Civil War with neither much building activity nor total abandonment. 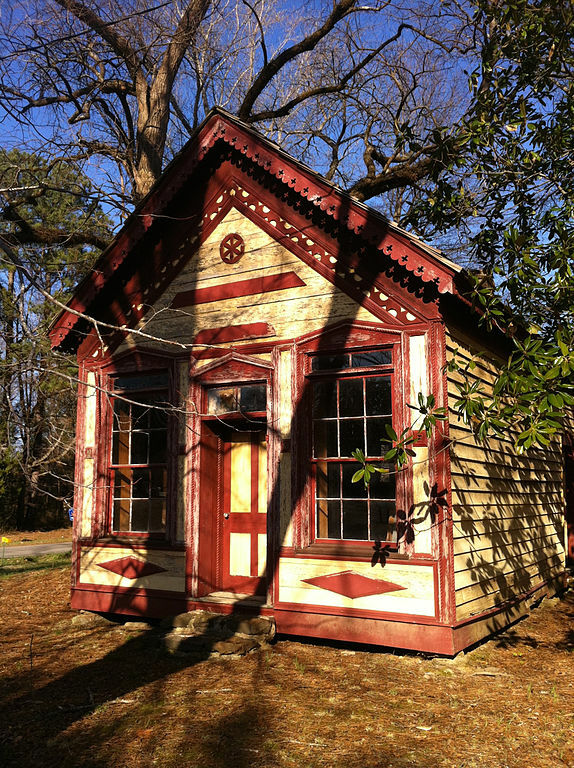 Although this building typology is now quite rare, some examples still exist such as the Dr. J. C. Francis Office (now the Dr. Francis Medical Museum) in Jacksonville, Alabama; the Governor Benjamin M. Miller Law Office and Jones Law Office in Camden, Alabama; Lawyer’s Row in Clinton, Louisiana; Old French Camp Post Office in French Camp, Mississippi; and Alston Grocery Store and the now-ruinous Piazza Store in Rodney, Mississippi. The Gainesville National Bank and the Coffin Shop, both in Gainesville, Alabama, are two extant examples which are very similar to the Dr. A. L. Moorman Office in form with the former and in style with the latter. The Dr. A. L. Moorman Office could have joined the many other lost buildings of its type that once dotted the South. By the early 1970s, it was in poor condition, as seen in a photograph taken just shortly after its relocation to Jacinto. A comment on the Itawamba Connections site indicates that the Stone family had retained ownership of Dr. Moorman’s Office and that Harry Stone spearheaded its move to Jacinto. The Jacinto Foundation was newly formed and very active at that time; it had been less than a decade since they had begun work restoring the Old Tishomingo County Courthouse. 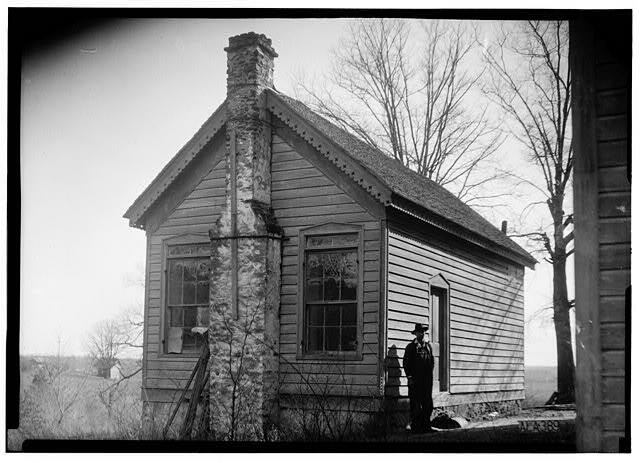 The Foundation restored Dr. Moorman’s Office fairly accurately, though two sections of wood on the front gable façade above the door are different than in the HABS photograph. 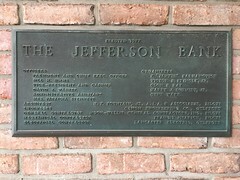 The Jacinto Foundation’s fortunes have ebbed noticeably since its heyday in the 1960s and 70s, harmed considerably by being forced for years to maintain the Old Tishomingo County Courthouse, Dr. A. L. Moorman Office, several other buildings, and several acres of parkland on merely $24,578 in Alcorn County appropriations; Prentiss and Tishomingo Counties have stopped providing any funding. The Daily Corinthian was filled with articles in 2015 and 2016 concerning complaints by neighbors about the condition of the historic courthouse and surrounding park. The Alcorn County Board of Supervisors responded to those complaints by cutting the funding to $6,000, just enough to reimburse the courthouse’s utilities. Supervisor James Voyles also publically supported ending the Jacinto Foundation’s lease agreement with Alcorn County on the property surrounding the courthouse, property that includes the Dr. A. L. Moorman Office (but not the courthouse itself), and transferring the upkeep of it to a to-be-formed community group. The proposal appears to have gone nowhere (the difficulty of finding news from that area makes me hesitant to declare the proposal dead with any certainty). But, such a proposal would put Dr. Moorman’s Office, already suffering from deferred maintenance, in a precarious long-term position. Although it received a few hundred dollars’ worth of painting within the last couple of years, it requires work to repair noticeable sagging on one side façade. 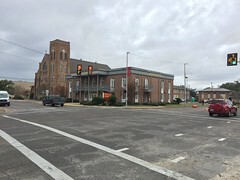 The building is a Mississippi Landmark, which gives it strong (but not complete) protection from demolition but is an appellation that does not prevent neglect from occurring. The Jacinto Foundation has received some grant money since 2016 which allowed for the aforementioned painting (the lion’s share going to courthouse repairs) while the filming of Blood Country at Jacinto Courthouse in 2017 provided excitement and positive attention to the site. Both of these things provide some good news to a historic area that was sorely lacking any good news for a couple of years. Historic preservationists rightly believe that relocation is one of the last things that should happen to a historic building. But demolition is the last thing that should happen to historic building, and if relocating a historic building, even to another state, will prevent that from happening and preserve it, then that is what should be done. But the reason why historic preservationists feel so strongly against relocating historic buildings is that those buildings are robbed of some of their history and context in a new setting. The Dr. A. L. Moorman Office is an extreme example of that. Moved to another town, in an adjacent state, it becomes a “Reproduction Jacinto Doctor’s Office” or “an old house” or just some old building. The Jacinto Foundation should be commended for preserving the Dr. Office and should be aided in any future efforts to maintain it. However, we should also remember that the history of this building did not begin in the 1970s in Jacinto. For a century, it was a Bexar, Alabama landmark prominent enough to be documented by HABS in the 1930s. Right now, whether known as the Jacinto Doctor’s Office or the Dr. A. L. Moorman Office, the building and its history is generally forgotten and ignored. That situation should be rectified so that the next time a visitor’s eye is drawn from the Old Tishomingo County Courthouse across the street to a strikingly painted building, there is something for them to remember. Of note is that Goggans Cemetery, which I discussed in the comments section of Thomas Rosell’s “Biloxi Cemetery Canopies” post, is only 2 ¾ miles from the former location of the Doctor’s Office in Bexar. One of Dr. Moorman’s colleagues in the Marion County Medical Society was a member of the Goggans family. Bill Garland, “Hand-turned Stoneware Signed and Produced by Alabama Potters,” Alabama Stoneware & Pottery, http://alabamastoneware.com/pdfs/Alabama%20-%20Stoneware-marked.pdf. The Marion County Democrat, April 5, 1901. The entry on Dr. Moorman’s father-in-law, J. H. Stone, in Goodspeed’s History of Mississippi, 1891 edition is available on the Itawamba Historical Society’s website and illustrates the Stone family’s prominence in the Tremont area. https://www.itawambahistory.org/stone.html. Marion County News, October 30, 1902. The hard-to-find Alabama Ante-bellum Architecture: A Scrapbook View from the 1930’s contains reprints of those articles. It is somewhat fitting that Dr. Moorman’s Office was moved from Bexar to Jacinto as both are names inspired by the Texas Revolution. Mona Robinson Mills points out that Saltillo and Houston are other similarly inspired place names in that area: http://itawambaconnections.blogspot.com/2011/05/bexar-jacinto-houston-and-saltillo.html. The Daily Corinthian, September 15, 2016; https://issuu.com/dailycorinthian/docs/091516_daily_corinthian_e-edition. Two articles on Corinth Today discuss that plan: http://corinthtoday.com/2016/03/24/lease-alcorn-county-jacinto-foundation-may-soon-end-four-decades/ and http://corinthtoday.com/2016/03/25/residents-react-jacinto-lease-discussions/. Rodney Presbyterian Church was another filming site for Blood Country. The then-newly restored Jacinto Courthouse was featured in the 1972 Robert Duvall-starring film Tomorrow. Excellent article, W. White. Indeed, the physical environment and socio-political-cultural context is important in everything. I especially appreciated that without context, we do not have a fully accurate understanding of whatever it is we are exploring. I can’t believe I didn’t know about this sooner. Although I do have Robert Gamble’s book, it’s been a while since I read it, and that particular detail obviously passed me right by. Thanks so much for bringing this somewhat forgotten little gem back from obscurity and giving it a history again! very interesting on so many levels; thanks, mr white. a collection of such smaller structures(along with larger houses, churches, etc) in my area is the genesee country village and museum, caledonia-mumford, ny, about 60 miles west of lyons; it was influenced by old sturbridge village, ma, which, of course, was influenced by such building collections in europe. the ny state buildings are not so different from those in ms and al–boxes with a few details from the current styles-federal, greek revival, gothic revival, etc. I agree about interesting on so many levels. The Dr. Casey office building in Woodville is another example. It too was moved, but only three blocks, from the front yard of a residence, to a lot across the street from the Courthouse, where it became a law office. My wife and I did a certified rehabilitation of it several years ago. 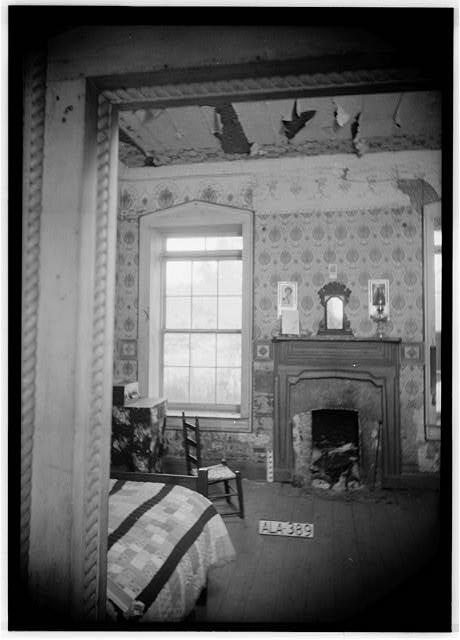 The original three rooms were restored, and a extension (kitchen, dining counter, shower bath and closet) added at the rear. Photos available on the link below. An extant small, gable-front commercial building that I overlooked in the post is the Stennis Law Office, located at 508 Jefferson Street in Macon and constructed in 1838. It is an exceptional survivor of that building typology, in this case with vernacular Greek Revival detailing. Note on the Google Street View the contrast between it and the early Twentieth Century buildings surrounding it. It helps one to imagine the incredible change to the character of Macon (and other Mississippi towns) when these small, gable-front buildings were replaced by more urban commercial buildings.